This is a spiral-bound, paper cover book measuring 6.25″ / 15.9 cm by 9″ / 22.9 cm (including spiral). The book will ship to you via priority mail (flat rate), so you are paying about $12 for the book. If you are outside the US, I cannot ship to you because I don’t do VAT. If you are in Canada, I’ll ship to you, but you will have to pay actual postage (so sorry! ), so it would be $12 + actual postage. 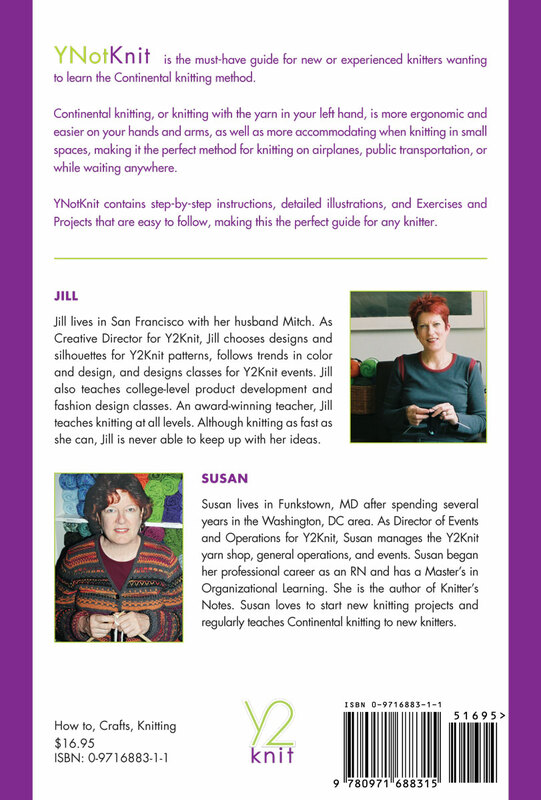 YNotKnit was written by me, Jill Wolcott, and my sister, Susan Wolcott, when we had a company called Y2Knit. That company no longer exists, and since I did most of the content, the book became mine. At the time that division of assets was made, YNotKnit was still selling as a spiral-bound book; I quit trying to sell YNotKnit as I toyed with the idea of releasing it electronically. I didn’t do that back in 2012 as there were so many videos, etc. I wasn’t sure it made sense. I still have a box of books. 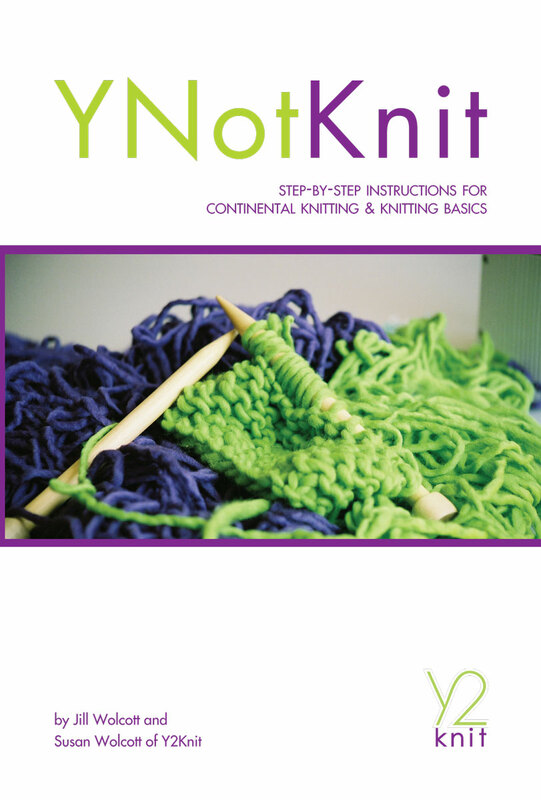 YNotKnit: step-by-step instructions for Continental knitting & knitting basics in printed form is being offered so I can get that last box of books into the hands of knitters! I have to ship the books to you, which is why I don’t usually sell it. I’m selling YNotKnit at a discount, but you will get it via priority shipping because that method allows me to drop it at the post office. Not the cheapest method, but time is my most valuable asset! There are 96 illustrations in the book (of my hands, mostly) showing you how to hold the yarn, needles, and stitches. There are projects to help you master continental knitting. If you already knit, the knit stitch comes easily and you will dash off to the purl. Purling is more difficult, so be sure you are very clear on the knit stitch first. If the purl is easy, you are doing it in reverse and your stitches will be twisted. Don’t do that (you can untwist them, but since you are learning, save yourself some work!). The book has some other information which may seem dated (or why would it be in a printed book) because the world was different in 2006. If you need help, you can email me. Others are always amazed that I can knit without looking — that is one of the supreme joys for me of knitting Continental — it takes less physical attention and is less taxing on your right arm. I learned to knit as a thrower; my tension is better and I am a faster knitter as a continental knitter. 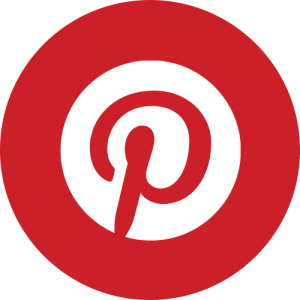 You might like Continental knitting too! You can read reviews (good and bad) on Amazon. Find more information under the tabs! Shipping information is under Sizes. You can also purchase it through third-party sellers on Amazon. Needles, Supplies, and Yarn each include that information.